corporations to multinationals to government bodies. 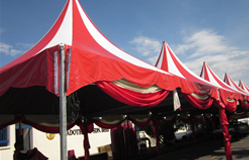 We provide various types of canopies tents such as half moon canopies, Arabian canopies, pyramid canopies, transparent canopies, membrane canopies, marquee canopies, stage decorations, scallop decorations, portable dance floor etc. 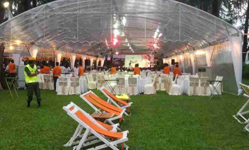 Besides, we also accessorize tents with side-wall, underlayer, backdrop design, skirting, carpeting, table & chair, light & fans, air cooler and other accessories.